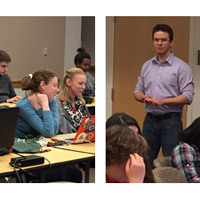 Jeffrey Berry '12 led biological sciences students, alumni and faculty in a workshop on using RStudio in data analysis. Those who study and teach Biological Sciences at Webster University recently welcomed back one of their own to share insights from the field of biological research. Jeffrey Berry ('12), who holds undergraduate degrees from Webster University in Biological Sciences and in Mathematics, returned to campus to lead 20 Biological Sciences undergraduate students, alumni and faculty in a workshop to use RStudio for data analysis and presentation. The Students for Biological Sciences club hosted the event and invited Berry, who now works at the Danforth Plant Sciences Center. The "R Bootcamp" was a free weekend workshop held March 19-20 in the Emerson Library. RStudio is a suite of open source products to help researchers and innovators in science, education and industry collaborate and scale their work in R, an open source statistical language and computing environment. Webster's Students for Biological Sciences club is a student-run organization that aims to promote scientific learning and to foster scientific interests with engaging discussions, student forums, guest lectures and interactive activities. For more information please contact club president Joshua Embry at: joshuaembry27@webster.edu. Mary Preuss, associate professor of Biological Sciences in the College of Arts & Sciences, is the club's faculty mentor.